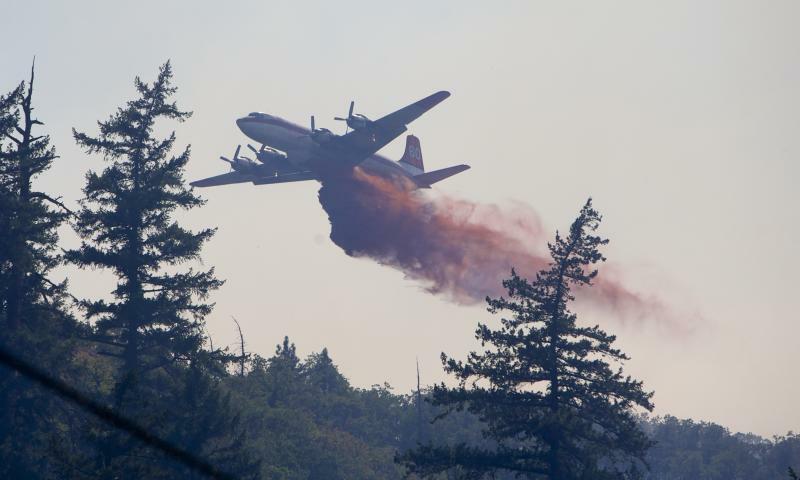 GRANTS PASS, Ore. (AP) — Running out of money to fight wildfires at the peak of the season, the U.S. Forest Service is diverting $600 million from timber, recreation and other areas to fill the gap. The nation's top wildfire-fighting agency was down to $50 million after spending $967 million so far this year, Forest Service spokesman Larry Chambers said Wednesday in an email. Chambers says the $50 million the Forest Service has left is typically enough to pay for just a few days of fighting fires when the nation is at its top wildfire preparedness level, which went into effect Tuesday. There are 51 large uncontained fires burning across the nation, making it tough to meet demands for fire crews and equipment. Forest Service Chief Thomas Tidwell sent a letter Aug. 16 to regional foresters and other top officials telling them to come up with the cuts by Friday. "I recognize that this direction will have significant effects on the public whom we serve and on our many valuable partners, as well as agency operations, target accomplishments and performance," he wrote. "I regret that we have to take this action and fully understand that it only increases costs and reduces efficiency." It was the sixth time the Forest Service has had to divert funds since 2002, Chambers said. The step comes as the Obama administration has been cutting spending on thinning national forests to prevent wildfires, and despite Congress creating a special wildfire reserve fund in 2009, known as the FLAME Act. Congress dedicated $413 million to the reserve in fiscal 2010, but cut it to $290 million in 2011 and raised it to $315 million in fiscal 2012, according to Forests Service documents. This year it dropped to $299 million after sequestration. "The Forest Service, when it lobbied for the FLAME Act, said, 'Look, if you give us this reserve fund for large fires, we won't need to raid other parts of our budget,'" said Andy Stahl, director of the watchdog group Forest Service Employees for Environmental Ethics. "The Forest Service instead used up the FLAME money and is now using other parts of its budget. That is giving the agency a blank check and it just keeps putting more zeros on it." The mandatory budget cutting measure known as sequestration reduced the Forest Service budget 5 percent, forcing cuts of 500 firefighters and 50 engines. Wildfire spending by other federal agencies takes the total to $1.2 billion so far this year, according to the National Interagency Fire Center in Boise, Idaho. That is more than half last year's total of $1.9 billion, and fast-approaching the 10-year average of $1.4 billion. There have been 33,000 fires that have burned more than 5,300 square miles — an area nearly the size of Connecticut. Meanwhile, the Obama administration has been steadily cutting spending on thinning federal forests to reduce fire danger, and has proposed to cut even further. The acreage treated would drop from 1.8 million acres thinned in 2012, to 685,000 acres next year, according to the U.S. Department of Agriculture budget. "The fires that are ripping through Oregon and Idaho and California and the West are just proof that the fire prevention policy is broke," Sen. Ron Wyden, D-Ore., chairman of the Senate Natural Resources Committee, said from Lincoln City. "There are nears of neglect. The fuel load builds up and it gets hotter and hotter on the forest floor. Then you get something like a lightning strike and a big inferno. Then the bureaucracy takes money from the prevention fund to put the fires out and the problem gets worse. The cycle just repeats itself again and again." Wyden said he and other senators would be working hard this fall to overcome pressures to cut spending in order to restore funding for wildfire prevention. Christopher Topik, a director of Restoring America's Forests for The Nature Conservancy, said he could not fault Tidwell for diverting money to wildfires. "We can't allow our towns and forests to all burn down," he said. "It's also irresponsible not to fund (prevention efforts) because it is an expected disaster."